A station plat book maintained by the railroad's superintendent supplied the details above. On the north side of the Stanislaus River lies the small community of Burnett's. 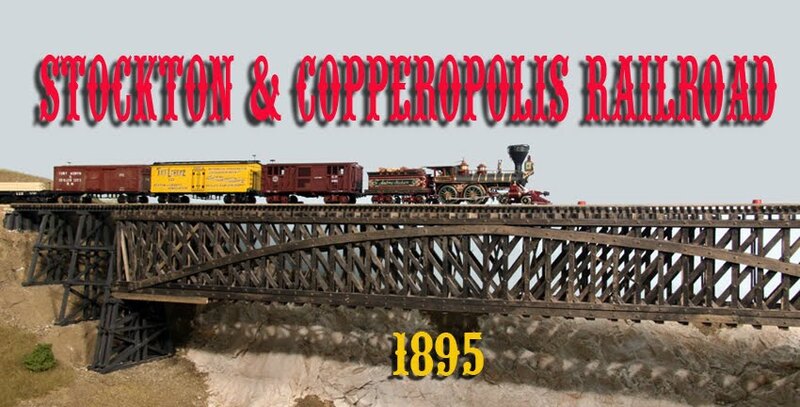 During the era of my S&C Railroad, there was a siding with a grain warehouse and a corral. The main wagon road to Oakdale crossed the tracks here heading upstream to the county bridge. Later on, when the wheat farms were being broken down into smaller ranches for produce and fruit, there was reportedly a small factory for making the crates used in the field. The Dakin map shows sizes and building construction. The earliest record of the arrangement of buildings appears in a notebook of station plats maintained in the 1874-1888 period. I copied the information and developed my own sketch for modeling purposes. Later on, I discovered the Dakin maps showing several of the warehouses along the S&C. The Burnett's map show additional building details which will aid in its construction. 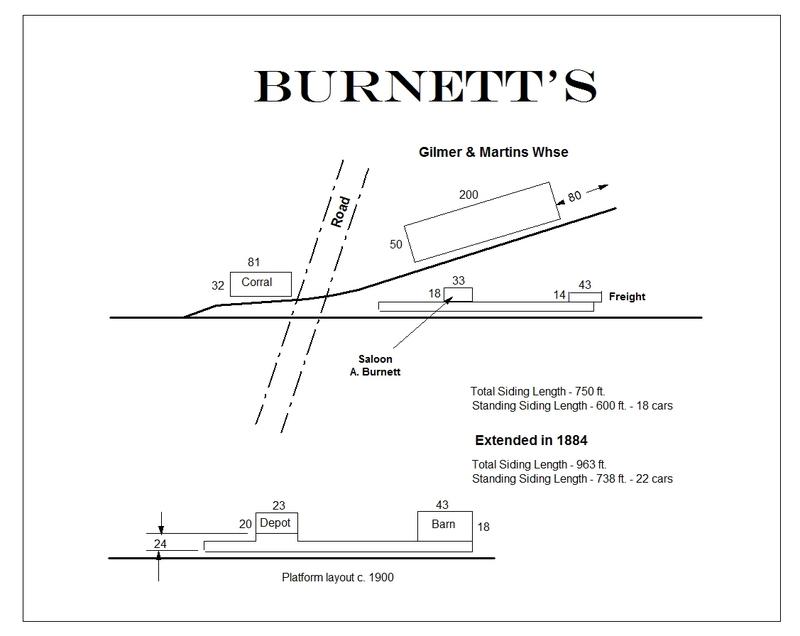 My model of Burnett's will include both the grain warehouse and the crate/box factory along with the corral. 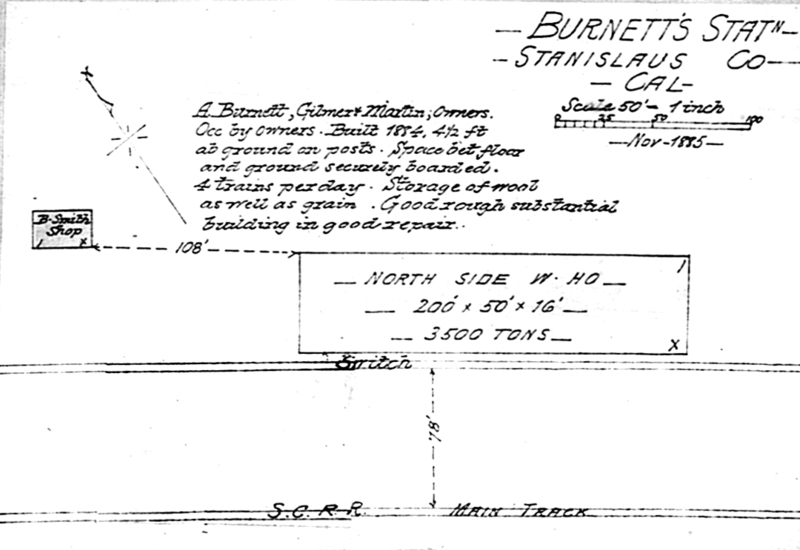 There was no agent at Burnett's but the drawings show some sort of waiting shelter along with a small building for freight. The absence of photos requires me to freelance everything but all will be in accordance with similar buildings. The Golden State Box Company. The ground around the building will obviously have to be reworked to properly settle the building. Peeling paint and fading signs show that regular maintenance is not a priority with the proprietors. My first structure is the box factory. I had a Walthers "Shed on Piles" which seemed to be about right. I wanted the factory to be an older building, possibly a former grain warehouse, which was cheaply whitewashed a few years ago and not repainted. I achieved this effect by painting the structure with a light gray primer followed by white. A small wire brush was used to remove random sections of the paint to allow the gray to show through. 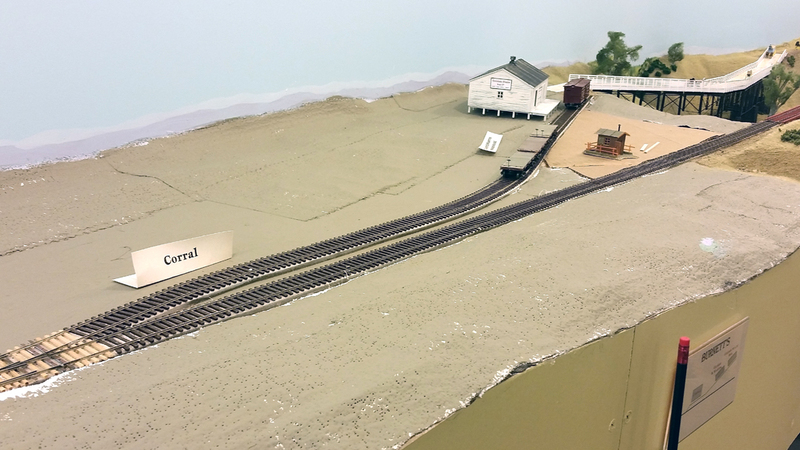 The stock roof was covered with Minuteman Scale Models rolled roofing and a small loading dock was added. An overall view of the Burnett's area shows the future locations of the structures. The temporary signs are used to identify switching locations during operating sessions.